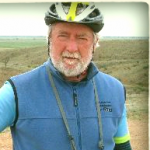 Six riders including a support driver set off by car under cloudy skies for Canberra, our weather guru’s on the trip predicted a good first day of cycling out to Captains Flat but was not overly confidant for the remaining two days. It rained all night in Canberra, but we did wake up to a glorious morning, repairs to Johns bike delayed our departure before we soon set off for Captains Flat in ideal cycling conditions cool weather, blue skies, pristine countryside with some rolling hills and not much traffic. A few brave ones pitched tent at Captains Flat, the others took refuge at the local Hotel (the right move). The rain came back with a vengeance the following morning, enough to heed the local SES advice and cancel the rest of the trip and head back to Sydney. This ride has great potential we will be back. Bad luck. It was a very strong weather system. At least the mud wasnt that sticky red stuff!